05-Nov-2005 -- Geographically, culturally and historically, Yemen is a nation of contrasts and extremes. Its landscapes must rank amongst the most dramatic on earth - from the sun's anvil of the Ramlat al-Sab`atayn desert to the high mountainous region upon which its World Heritage status capital, Ṣan`ā', is perched. Its people are fiercely independent, determined to hold onto traditional ways of life, and have resisted foreign influence for millennia. And it boasts an archaeological legacy dating back to the time of the Queen of Sheba, who some say hailed from that great fissure in the earth known as Wādiy Ḥaḍramawt. We had the privilege of moving to this jaw-dropping, awe-inspiring country four months ago. 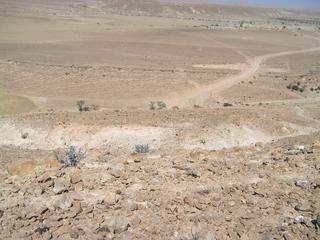 And it was the Ḥaḍramawt region that we chose as the destination for our first real excursion from Ṣan`ā'. Ḥaḍramawt itself is a Governorate in the modern state of Yemen; its capital, al-Mukallā, is located on the coast some 130 km from the ancient site of Qana` - the port that serviced the incense trade. A four-hour, nerve-shaking northerly ascent takes you to Wādiy Ḥaḍramawt proper, of which more will follow in the report on our visit to 16N 49E. If one chooses to follow the old incense road, the journey from Ṣan`ā' to al-Mukallā takes around 12 hours - best accomplished with a mid-way camp overnight in the desert. To reach the confluence point, it is necessary to follow the coastal road east from al-Mukallā to al-Riyān, then turn north. Near the point, there is a large sign pointing the way to Say'ūn, and a branch road on the right, complete with military checkpoint. We asked the army personnel to let us have 'ten minutes to look at the countryside', and after some gentle persuasion in Arabic, they kindly agreed. A short distance down the road brought us to a large black rocky outcrop, at which point we went off road. It soon became clear that the area was an old, probably abandoned, quarry, but it was just about passable in the Land Rover. After several false turns, and nearly giving the search up for lost, we got the vehicle into a position just 150 m from the confluence point. It was then an easy scramble down a quarry side: 15N 49E lay mid-way down the rock-gravel slope. Notes: Phil Boyle works at the British Embassy, Ṣan`ā', and Sarah Marchant works at the Ṣan`ā' British School and the Department for International Development (DfID). We plan to live in Yemen for the next three years, and, alongside other members of the Embassy, hope to photograph and report on many more of the remaining 44 confluence points in Yemen during our time here. Yemen is a fabulous country, and the Degree Confluence Project is an excellent way of showcasing its geographical heritage. For those wanting to confluence hunt in Yemen, travel is not an entirely simple affair. We're lucky to have our own 4-WD, and to be able to speak Arabic. Although not strictly essential (as proved by the excellent, earlier reports from Rainer Mautz, Elionora and Maḥfūẓ), it certainly makes things a lot easier. One should also be aware of sensitivities around the numerous military sights and checkpoints, and be familiar with the current travel advice (see Foreign & Commonwealth Office, or the website of your own country's Ministry of Foreign Affairs).